I just wanted to share some pics of the dedicated Donkey Kong I picked up from eBay. The side art, t-molding and instruction cards clearly need to be replaced. The laminate on the sides is in decent (but not great) shape and has several spots that will need touch up. I haven't decided yet what I'm going to do... it seems a shame to just paint over it given it's in mostly good condition, but the spots that are bad are noticeable. The marquee and bezel artwork is in pretty good shape but the monitor plexi has scratches in it. I'll have to see if I can get rid of the scratches somehow or if I need to just replace the whole bezel. The coin door has the typical nasty credit button shoe-horned into it and seems to be missing the metal "supports" that hold a returned coin. Some of the wires were snipped for some reason, so I'll have to work on that. It's missing the drawer that holds the coins and didn't come with keys, so that's something else I'll need to figure out. The joystick appears to have an 8-way restrictor plate installed. It's in okay (again not great) shape, so I'll need to figure out whether I should find a 4-way restrictor to replace it with or replace the whole stick. The buttons need replacing since it looks like 2 of them have had their edges melted with a soldering iron. The CP artwork is in good shape but the plexi is discolored in several spots and will probably need replacement. Monitor looks good and has clearly been recapped. I noticed some minor sparkling during the intro sequence but nothing during the game. Sound is good with a little background buzz (need to find the volume control and turn it down though!). So, all in all, there's a bit of work to do to this machine, but I'm excited to get going on it! You got yourself a nice looking cab. Good luck with the restoration. I look forward to your progress. That left side must have been in a window or something. FADED!!! You should strip the artwork off of both sides and buy new artwork from www.arcadeshop.com. Also, you can get a 4-way restrictor from www.mikesarcade.com. If you have to use any woodfiller at all, you may as well, sand the whole cab down, primer, and paint. Does the thing work? You didn't mention. You should get the D2K kit/Braze high score kit. They sell the combo together from www.arcadeshop.com also. 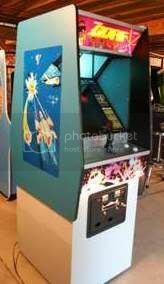 I was debating between quarterarcade.com or arcadeshop.com for the side art. I've seen people say good things about both. arcadeshop's stuff appears to be $17 more. The game itself is working great and the monitor has been capped and looks sharp and colorful with no screen burn-in I can detect. I did see that mikesarcade.com had the restrictor plate, but now that I've inspected the joystick in more detail, I'm not sure what to make of it. It seems too tall above the control panel and the ball top doesn't seem to quite fit the shaft. I've attached a close up pic of it. I'm considering the Braze kit for the future, but for now I want to keep it original. The ball top looks like it's not screwed on all the way. you might try and loosen the set screw and screw the ball on farther,there should be a squared end on the stick end to hole shaft with a wrench. I also have side art from quarterarcade you can have for $40.00 + shipping. PM if interested.I just noticed it looks like no set screw in ball top. Could you take picture of underside of control panel to verify you have a Nintendo joystick. If you do videogameparts.com has replacement shafts if yours is not Nintendo or stripped or something else is wrong with it. There is a coin box on eBay check it out. mikes arcade also has replacement buttons.They are not exact but look pretty good. Dude, there is 1500+ coin boxes on ebay! I think this is the one he might want to check out. Attached is a photo of the underside of the control panel. It looks to me like a Nintendo joystick. There is a set screw hidden in the ball top which I loosened and attempted to screw the top on tighter. Either the ball top's hole isn't deep enough or the shaft thread is too long -- it can't screw down completely (although I was able to get it down further than it was). The shaft thread is still exposed however even after tightening. I wasn't able to find anything on videogames.com. I did find a site called videogameparts.com that had replacement shafts -- I assume that was what you were recommending? Yes that's a DK joystick. Either the threads in the ball top or on the shaft are probably bad. If you can take it apart you might find the problem. If you can't fix it you could buy a shaft and ball top from videogameparts.com. Assuming the stick works well. It would probably cost less than mikes stick. Yours looks to be in pretty good shape. Thanks for the further info, Jimkirk. I've taken the joystick apart and both the threads on the ball top and the shaft look okay. I'm wondering if at some point, someone put a different ball on there. I'll probably just wind up replacing them since the shaft is in so-so condition anyway. On another note, I lost the auction for the coin drawer. Does anyone have some measurements and pics of the drawer itself they can share? It looks like it's fairly straightforward to build from scratch and I may go that route since it'll only cost a few bucks to make one out of plywood vs. spending $30 to get a used one. Below is a pic of the cam lock I removed from the coin door. It looks to me like it's 3/4" but all I really see mentioned on the board is 5/8" and 7/8". Am I reading the length wrong or is this an oddball lock? Any idea where I can find a replacement? LOL -- it's always better to have clear goals I already feel the urge to get my score higher! Yes that is a 3/4'' lock. I used a 5/8'' lock with straight cam lever on my DK. I have a 5/8'' lock with a tubular type key you can have free,just pay shipping or you can check local hardware stores for one.Let me know if you want the lock. I've replaced both the joystick restrictor plate and the buttons with items from mikesarcade.com. The restrictor plate works great and the joystick now operates the way it should. The buttons, as others have said, are not quite the correct color, but otherwise work great. It's good to see the marquee lighting up! I've removed one side of the art (the really faded one). It came off easily with a blow dryer, however, it did leave a lot of gummy residue. A little work with Goof Off took care of it nicely, though. You can see how yellowed the laminate/paint is in the pic below. Also attached is a pic of the replacement bezel from arcadeshop.com. I received my CPO reproduction plexi and instruction card from tntamusements.com today. I took the opportunity to completely disassemble and clean the joystick using WD-40. It managed to come pretty clean and I lubed the ball joint with some bicycle lube. It now returns to center cleanly whereas it used to get stuck to the right periodically before. I reassembled the CP and replaced the missing bolts with new ones from mikesarcade.com. The new plexi overlay is a little thicker than the original, so I had to adjust the button switches so they get triggered properly. The black on the CPO needs to be touched up and the t-molding on the front needs replacing, but otherwise, the CP practically looks new. Anyone have any idea what kind of t-molding is used on the front of the CP? It looks thinner than the rest of the cabinet. The t molding is the same on cp as the rest of the cab. It can't be found anymore. The closest match is Nintendo t molding from tmolding.com. Here is the link http://www.t-molding.com/store/home.php?cat=5. If your cab is plywood 9/16'' is what you need,otherwise 5/8'' is for particle board cabs. Why did you replace your bezel? The one you have looks to be in good condition. If possible, could you take a pic of the original bezel and the Mikesarcade bezel side-by-side? I would like to see how close Mike's comes to the original. Just a curiosity, why didn't you replace the marquee with one from Mike's to go along with the new bezel? What are you going to do with the original bezel? What is the condition? 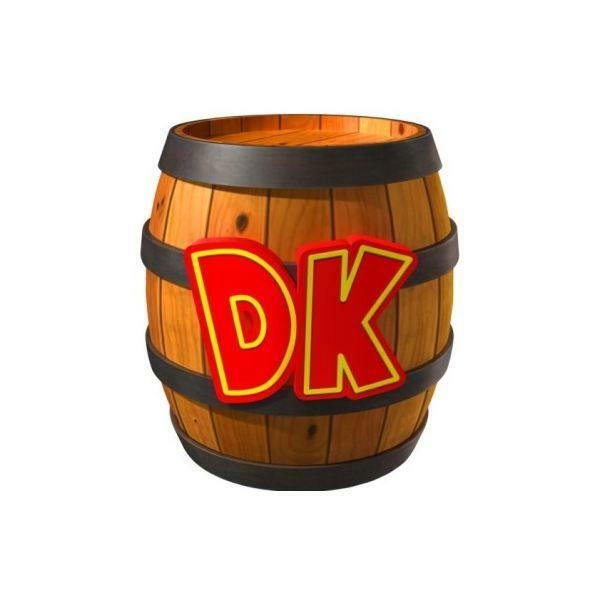 I am in the market for an original DK bezel myself. Although you can't make it out in the picture, the bezel has scratches on it which are a bit annoying when looking at the monitor. I haven't pulled the protective paper off the new bezel yet, but will take a side-by-side photo as soon as I do. From comparing just the bottom right corner of the bezel with the original, it looks spot on. The marquee is in pretty good shape, and there were higher priorities for replacement. It has some light scratching on the face and a small scratch on the artwork itself. I'm currently leaning towards keeping it. I was planning to just keep it as a backup but would be open to selling or trading it. If you'd like, I can try to take a photo that gives an indication of the scratches that are present. There may be a way to buff them out that I'm not aware of. They also may be acceptable to someone who really wants an original bezel... I preferred a scratch-less repro myself. Great, I would love to see the two bezels side-by-side. I might be interested in the original bezel if it isn't too scratched up. Like you, I would probably be unhappy / disctracted if it wasn't in pretty god condition. I have been in a bit of a debate with myself over replica vs original bezel, marquee and CPO. If the new stuff is very close to the original, that may swing my vote, but I don't want new reproduced if it is much different from the original. Mike from Mike's Arcade advised that the bezel repros are thinner than the originals which is why he doesn't offer the lower bezel bracket that is on the original machines. Don't know if that is an issue for you, but if you buy a repro...you'll need one of his extension brackets to keep it secured. We put some paint on the corner of the wood that was color matched. The color seems spot on - even in direct sunlight. The paint has a slightly glossier sheen than the original, but it's very subtle and won't even be noticeable once the cab is painted. In the pic below, the paint spot is circled. Also attached is a pic of the cabinet as it stands prior to beginning the bondo repair process. I created a makeshift paint booth in my basement storage room in order to spray the machine. As with Neil's restore, I decided to paint the inside black first. Here's a pic after a few coats of black spray paint along the inner edge. Here are the two front pieces after bondo and sanding. I'm in the process of priming the sides and front pieces with an air sprayer. I will post pics a little later. Thanks, AnthonyB. I'm not sure what specifically you want measured. Can you give me some more detail? farb, I'm looking for the bottom wooden board that the monitor is attached to, ant the piece of wood behind that. Unfortunately, my cab is taped up covered for painting. As soon as I'm done and can remove the tarps, I'll measure those two parts for you. Wow. The sprayed on paint looks great. I went the roller route, and while it looks decent, I wish i would have sprayed instead. Yeah, that looks really nice! Makes me regret using a foam roller for my Junior, but I really couldn't justify the time investment to spray it (I have all the tools already). Nice work. Paint looks good sprayed on.